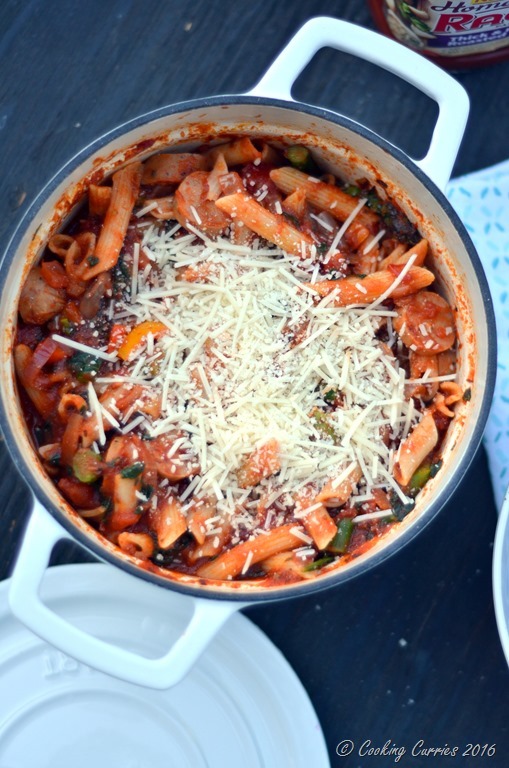 Sausage and Spring Vegetable Pasta made with RAGÚ® Homestyle Sauce coating every bit of the pasta, makes for an easy breezy and super delicious weekday dinner that everyone in the family will love! 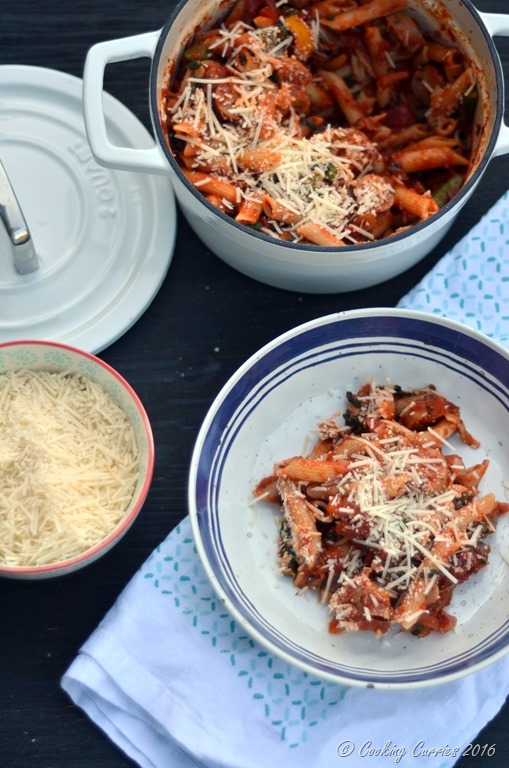 Pasta of any form, usually with a tomato sauce is a staple dinner recipe that shows up on our dinner table at least once a week. It is one of the newer traditions of eating together as a family that we have now. It was not necessarily introduced after planning for it, but it just seemed to work out that way, especially because we all love pasta and the grown ups especially love to enjoy a glass of wine with it and more so because it requires less planning and you always have everything in the pantry that you need to get the dinner going with. I am sure all families have one such staple recipe or meal that shows up most of the times on their dinner table. Growing up, it was dosas – a thin crispy Southern Indian crepe made with fermented batter of lentils and rice. Amma makes the batter in bulk over the weekends and it mostly ends up on our dinner tables aside from breakfasts. Being a working mom, it was easier for her to know that the batter is there in the refrigerator when she comes home and all she needs to do it to whip up a quick chutney and make the dosas and everyone is happy and full and fed. 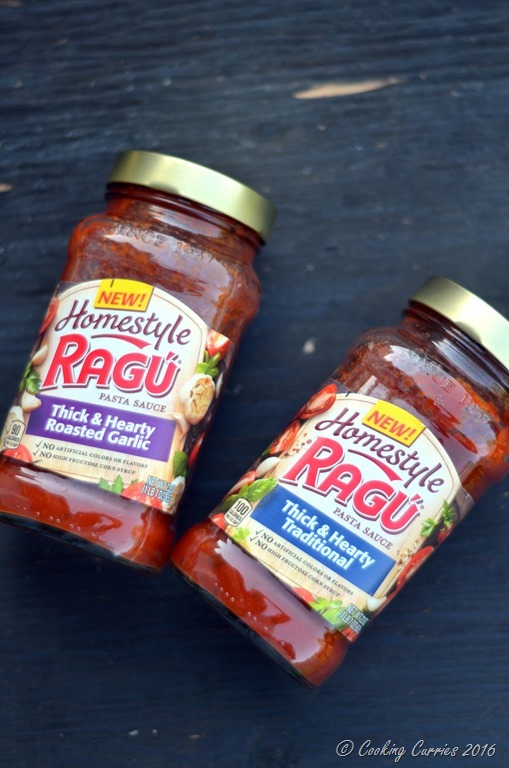 I am glad to have found this RAGÚ® Homestyle Sauce range to add to my list of favorite pasta sauce to provide some variety to our pasta dinners. The great thing about them is that, unlike other pasta sauces, they are so thick, that a little really goes a long way and the way they coat the pasta and kinda sticks to them, makes everything so much more delicious. And the best thing of all is, especially what is most important for me and my family is that the ingredient list at the back of the jar is short and you know of everything that goes into the jar. There is no artificial flavor, artificial color or high fructose corn syrup. These new Homestyle range of Ragu pasta sauces come in five different flavor combinations and so far we have tried and loved the RAGÚ® Homestyle Thick and Hearty Traditional Sauce and the RAGÚ® Homestyle Thick and Hearty Roasted Garlic Sauce Check out the other pasta sauces they have in the Homestyle range here. 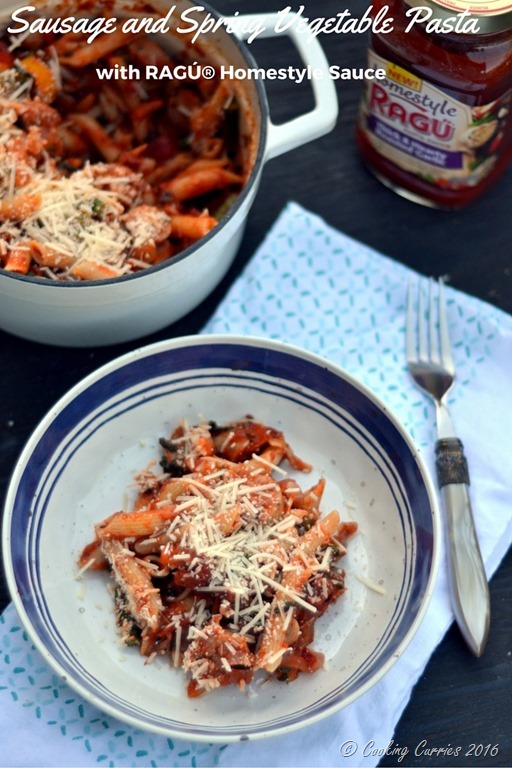 This week, I’ve partnered with RAGU to bring you a delicious recipe made with NEW RAGU Homestyle Pasta Sauce. Check it out here, and see how this sauce hugs every last noodle. Need more dinner ideas?? 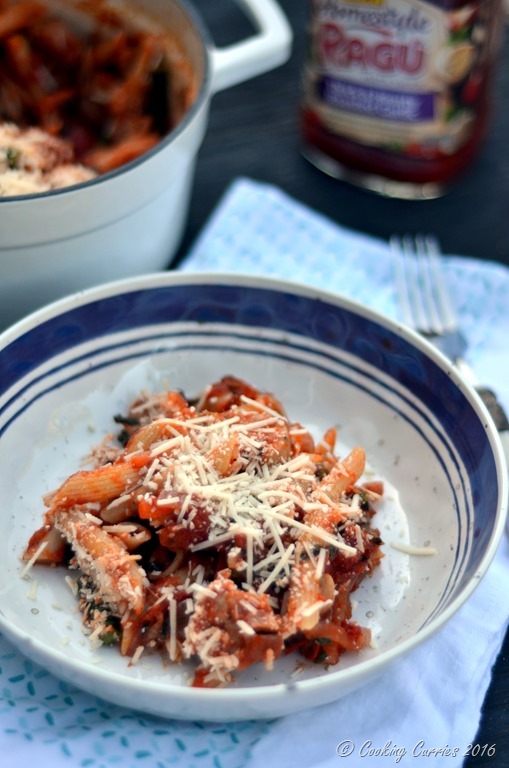 Check out Ragu’s website to see what other recipe you can use to make your weekday dinners easier. Cook the pasta in salted boiling water till al dente. Drain and keep aside. Heat the olive oil in a heavy bottomed pan. Add the shallots, asparagus and mushrooms and sauté till soft. Add the sausage rounds and let it cook and brown a little. Now add the spinach and cook till it wilts. Add a little bit of salt and some freshly crushed black pepper to season. Now add the RAGÚ® Homestyle Thick and Hearty Traditional Sauce and 1/4 cup water or pasta water, if you have any saved. Add the pasta to it and let it simmer for a while till the sauce coats the pasta well. Top with the cheese just before serving and serve hot. What a perfect way to use all your spring veggies! I LOVE using chicken sausages, this looks great!